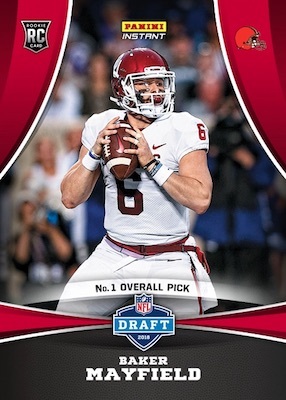 2018 Panini Instant NFL again guides football collectors from the start of the new year into the key draft, pre-season, regular season, playoff and Super Bowl moments. 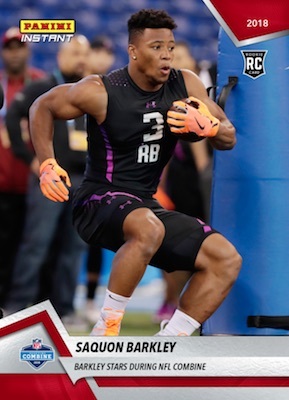 Just as it did in 2017, 2018 Panini Instant NFL gets underway with the pre-draft standouts at the NFL Combine. Fans can purchase cards individually for $9.99, which is the standard pricing, or obtain the entire seven-card set for $29.99. Although most cards have a 24-hour countdown timer, special releases like the NFL Combine or NFL Draft Night sell for an extended period. Also, many choices have low-numbered parallels, generally Green (#/10) and Black (1/1), but these remain available until the supply runs out. In the past, this has included random autographed versions of some cards. 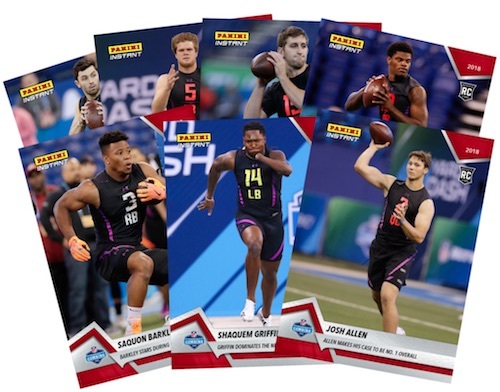 Be sure to visit this page often as it will be regularly updated with all the new 2018 Panini Instant NFL details. Shop for available 2018 Panini Instant NFL on Panini. Cards sold individually or as 7-card set. Total print run is 467 copies per card. Buy on eBay. PARALLEL CARDS: Green #/10, Black 1/1. Cards sold individually or as 50-card set. *Final three cards only in complete set. * Buy on eBay. 1-2018 Panini Gold Standard Football Hobby 12 Box Case. LAST ONE! Hard To Find!